Prof. Angelina YUEN delivers a speech at the Summit. 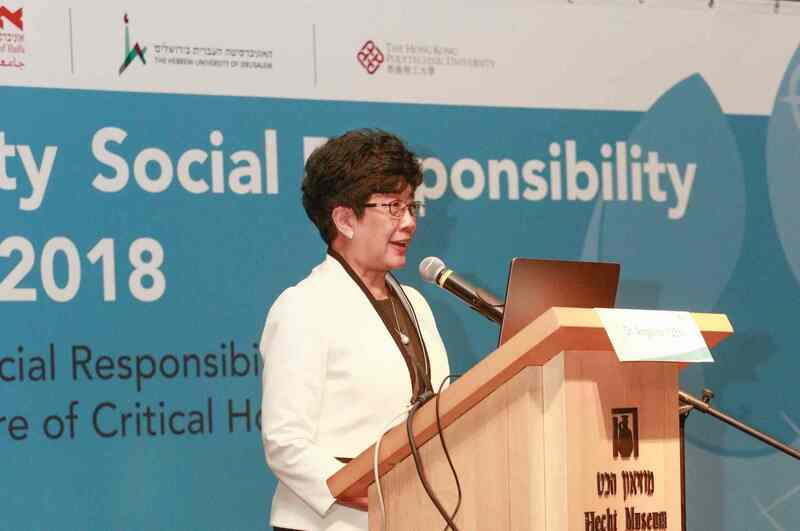 HUNG HOM, Hong Kong - Dec. 5, 2018 - PRLog -- The Hong Kong Polytechnic University (PolyU) co-hosted the University Social Responsibility (USR) Summit 2018 in Haifa, Israel, with University of Haifa and The Hebrew University of Jerusalem in early December this year. The USR Summit is a biennial flagship event of the University Social Responsibility Network (USRN), a global alliance initiated by PolyU. The USR Summit this year gathered over 100 senior government officials, academics, community leaders and students of higher education institutions from various countries to discuss the role of universities on the theme of "Universities' Social Responsibility in Shaping a Future of Critical Hope". Prof. Angelina YUEN, PolyU's Senior Advisor to the President and also the Chairperson of the Executive Committee of the USRN; Prof. Gustavo MESCH, Rector of University of Haifa; and Prof. Yaffa ZILBERSHATS, Chair of the Planning and Budgeting Committee, Council of Higher Education in Israel, officiated the launch of the Summit at the University of Haifa on Sunday (2 December). Prof. Yuen expressed the excitement of seeing USRN, which started from a small dream a couple of years ago, has now become a worldwide network to promote social responsibility amongst global universities. "We are very glad to work with so many renowned member universities across the world. We look forward to advancing the growth of USRN to raise the awareness of social responsibility among universities in different parts of the world." Mr. BAN Ki-moon, the 8th Secretary General of the United Nations, also sent his congratulations to this year's Summit through a video speech. The three-day Summit consisted of different plenary and parallel sessions around the theme of USR and study tours in both the Haifa region and Jerusalem. The inauguration of the USR Students Network was also held during the Summit. Student representatives from the USRN member universities made presentations on their community engagement experiences, and discussed with their counterparts about the possible collaborative cross-border projects. The Summit was concluded in The Hebrew University of Jerusalem on 4 December 2018. PolyU established the USRN in 2015 in the belief that universities have an obligation to collaborate as well as identify solutions to address economic, social and environmental challenges facing the world today, making the world more just, inclusive, peaceful and sustainable. USRN is a platform to bring universities together to exchange ideas as well as share resources and best practices. The member universities also collaborate on impactful projects in an endeavour to promote and foster USR initiatives in higher education on a global scale. Today, there are 16 member universities in the USRN.